We have refreshed the ever popular Avant Garde. The design of the leg has been changed, which we think improves the overall look of the table. The old model had a tapered leg style, running wide at the top to narrow at the base. The new leg is a straight design and it gives the table a very clean and more modern look. It’s been designed to be in proportion to the table body and looks more slimline. We didn’t want it to look overly large and heavy like some tables of our other tables. We have also added a great new colour option which we are calling Onyx Grey. The Avant Garde 2.0 is now available in 6 colours, and you can pick between any of our 9 cloth options. We have had the range professionally photographed and all images have been cut-out for a clean and professional, so you can all use on your websites. At DPT, we understand the importance of good quality photography and think you will agree that these pictures really do show the best of our new table. We have tried to cover all options that are available. You will be able to see that for yourself when you get the pictures though. You will have the option to show your customers a pool table, dining table with both wooden and glass tops and also with our new benches which are a fantastic option that you can offer to your customers. 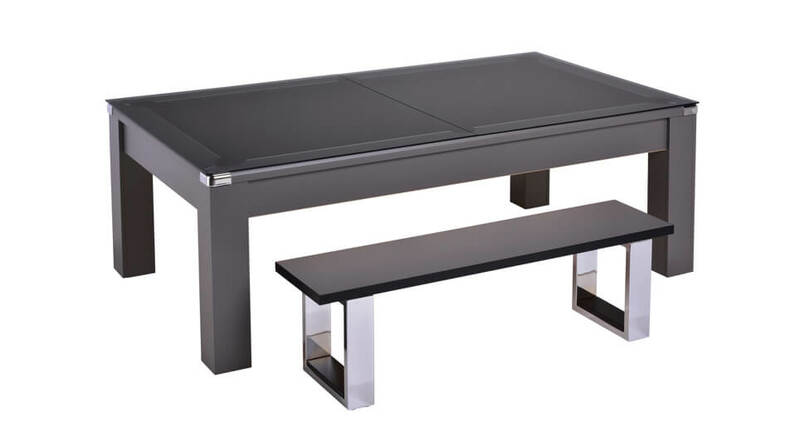 The perfect match to complete the look of the Avant Garde 2.0 Pool Dining table. We are now taking orders and the lead time will be around 7-8 weeks. And we only hope you appreciate this table as much as we do.